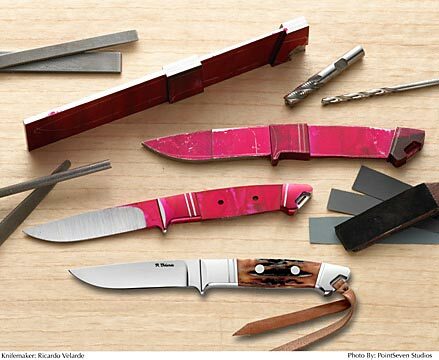 The beauty of these knives is that everything you see is made out of a single piece of steel. Where a fixed blade knife, 1/8" or 3/16" thick stock is typically used and everythings else is added on. Integrals and interframes are started from a 1/2" to 5/8" thick stock and is all one piece from the point of the blade to the end of the tang or pommel. The process on these type of knives is the following. Having decided on the design of the knife, I mill out the space for a 3/16" blade, and mill a tapered tang leaving the guard and pommel if included, full thickness. 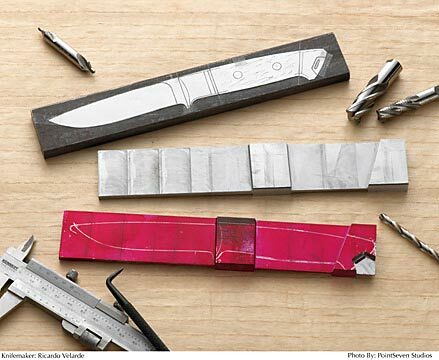 It is one of the simplest looking knives, and technically the most difficult knife to make. I shape and profile the knives by using files, and use a belt grinder to hollow grind the blade. Normally Semi-Integral knives only include a guard. 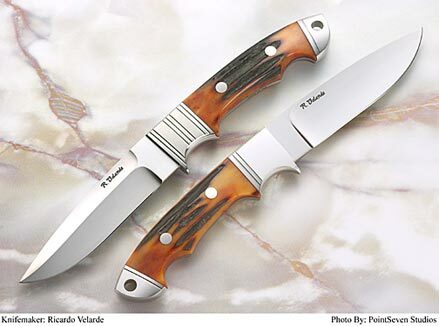 Full-Integrals knives include a guard and a pommel, and Interframe knives have a pocket on each side for the handle material.